OWC’s December Garage Sale Stuffs Stockings Without Picking Pockets. It’s just two more weeks left in 2010, which means this is our last “clearance” posting for this year. 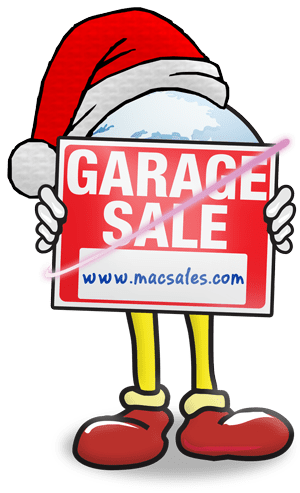 We’ve got well over 300 items we’d like to see out of here before the year is up, we’ve got them priced to make that happen in our December Garage Sale. Items are “first come, first served” and of varying limited quantities. Quantities are limited to that which is on hand and items automatically count down and ‘disappear’ as sold out. Sorry… no rain checks. Free or discounted delivery is available on almost most any order. Additionally, if you’re running late, and need it as soon as possible, we can get it to you the next day in most areas for an order placed before 10:30PM (Central) with expedited options. Over 100 different Genuine Apple Accessories — including Wireless and Wired Mice, Wired and Wireless Keyboards, Wireless, Video Cables, Docks, Cases, and more. See the full list of clearance items on our Web site. And… don’t miss our “Seasonal Savers” for more great deals. Finally, get up to up to $50 off an order just by using Amazon Checkout to place your order on our site. Other World Computinng: making your last-minute stocking stuffers that much more affordable. Those Apple keyboards and mice are at sweet prices.. The pricing is due to cosmetic damages, which are hardly notable on the bluetooth keyboard I bought. I would love to see a blog about where these items come from. In my area, the local Mac store gets products like this from schools that upgrade and auction off their old equipment.